I do some of my best drawing while my mother is in the hospital. Yes, these are a tad late for the calendar millennium. I named these after Stieg Larsson's Millennium Trilogy. I've listened to the audio editions of these books many times. Filling grids with color is a gratifying way to pass the time, but I consider these patterns for potential real-life quilts. The notes at the bottom of this sketch indicate how many pieces of each color I would need. Three selections on the Grid theme from my 2013 sketchbook. This last one is a product of a photo reference purge in my Oklahoma City studio. I chose my favorite photos, then chose my favorite square inch from each of those. Expect more sketchbook selections here on the Blog, and later, up in the Images section of the site. Rose Reconsiders (detail, in progress) Acrylic and colored pencil on Rives BFK, 2013 by Sarah Atlee. It appears that I will not have to buy pens again for some time. Sketch for Turnoff Vessel (unrealized painting). 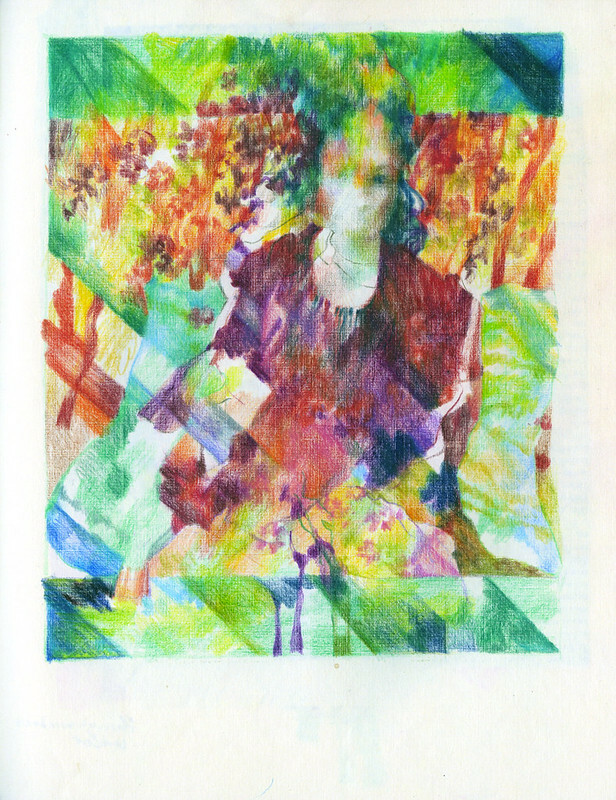 Colored pencil on paper, 2011 by Sarah Atlee.